The most expensive steak I ever tasted was cooked over wood coals in one of the trendiest restaurants in Los Angeles, and man did it have flavor. It just goes to show that sometimes the oldest methods are the best methods. Cooking over wood is still one of the most preferred methods of grilling for human beings just as it has been for our ancestors going back tens of thousands of years. A good steak cooked over wood coals may not even need marinade, rubs or brine as it absorbs the flavors of the wood. 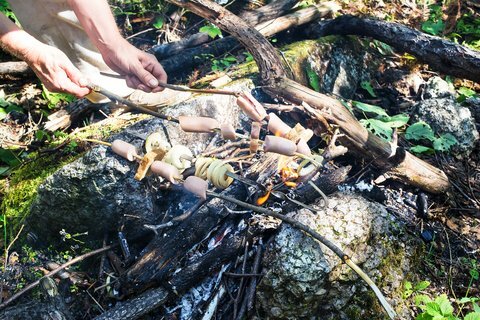 You can build a fire for campfire cooking in any number of ways. First you want to think about creating a structure, either a ring of rocks or a stack of bricks around the fire both to contain the flames and also for something to rest your grill once the coals are ready. If you have time build a Dakota fire pit with two holes that draws airs. If you can choose, it’s best to cook over hardwood than softer wood like pine. I have a cousin who swears by cooking over madrone. Whenever cooking with wood, you want to wait until the flames have died down before placing any food on the grill. A small flame lapping the food is ok, but anything too much and the food will burn. You also want to avoid smoke, which is another reason to wait for the flames to die down. Because wood coals burn out fast, it’s nice to have a second fire to shovel coals from or divide your fire into two sections, one for burning the other for cooking. Now you have several options when to comes to actually cooking your food. You can choose a grill, pot or skewer. For pots or pans, simply press them right into the coals and cook away. You can also dangle a pot above the fire with a tripod. Grills come with fold-up legs or just a simple grate from anything will work, even a shopping cart. For hot dogs or other meats you can also cook them hobo style on a stick. Choose a green one so it doesn’t burn. Lastly, take your meat and potatoes and spices, wrap them in tinfoil and toss it on the coals for the bullet method.